August 2016: Frederico published two new papers this month, one in FEMS Yeast Research ‘Maltose and maltotriose utilisation by group I strains of the hybrid lager yeast Saccharomyces pastorianus‘ and the other in Applied Microbiology and Biotechnology ‘Ploidy influences the functional attributes of de novo lager yeast hybrids‘. Manuela also had a paper accepted for publication in Journal of Microbiological Methods entitled ‘Simplified CRISPR-Cas genome editing for Saccharomyces cerevisiae‘. July 2016: Nurzhan’s research article ‘Assessing physio-macromolecular effects of lactic acid on Zygosaccharomyces bailii cells during microaerobic fermentation‘ has been accepted in FEMS Yeast Research. Anna published a review article ‘Blastobotrys (Arxula) adeninivorans – a promising alternative yeast for biotechnology and basic research‘ in the journal Yeast. January 2016: Angela participated in a Synthetic Biology course at EMBL in June last year. At the end of the course each group had to create a video about the project they developed during the 3 week course. 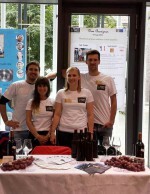 September 2015: David, Matthias, Leonie and Angela attended the 6th International Brewing Competition hosted at Hamburg University of Technology. They were awarded 1st prize for their beer ‘Dom Beerignon’ created by David and Matthias. April 201 5: Three new articles have been published on the Yeast Biotechnology Blog. A facebook page has also been launched to promote the blog and other YEASTCELL activities. 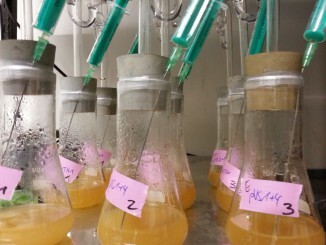 January 2015: The ESRs have created a Yeast Biotech blog that highlights recent articles or topics of interest from the field of YeastBiotechnology. The first articles were posted atthe end of January with more to follow in March. December 2014: A group of primary school kids visited the outreach lab at the UCD O’Brien Centre for science where Raúl Ortiz guided the students in performing simple experiments to help them understand what Saccharomyces cerevisiae (baker’s yeast) is and why it is used in baking. A full report can be found here. November 2014: This article describing the YEASTCELL project was published in International Innovation, a leading global dissemination resource for the scientific and research communities. November 2014: Javier Varela participated in a Researcher’s Corner at the Celebrate Science Family Open Day on 9th November at UCC. Javier was on hand to answer the public’s questions about Yeast Biotechnology. 4,000 visitors attended the event.